368 pages | 20 Color Illus. | 17 B/W Illus. 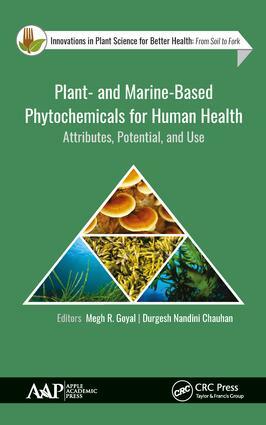 This new book, Plant- and Marine- Based Phytochemicals for Human Health: Attributes, Potential, and Use, provides insight with scientific evidence on the use of medicinal plants in the treatment of certain diseases. It describes bioactive compounds of marine and plant origin that have been discovered to be advantageous for human health, shedding new light on the potential of phytochemicals on human health and contributing to the ocean of knowledge on phytochemistry and pharmaceutical biology. In addition, the role of plant-based pharmaceuticals is also discussed as an example of innovative uses of plant product. This compendium will be useful for the students and researchers as well as for industry professionals working in the food, nutraceuticals, and herbal industries. Megh R. Goyal, PhD, PE, is a Retired Professor in Agricultural and Biomedical Engineering from the General Engineering Department in the College of Engineering at University of Puerto Rico–Mayaguez Campus; and Senior Acquisitions Editor and Senior Technical Editor-in-Chief in Agriculture and Biomedical Engineering for Apple Academic Press Inc. He has worked as a Soil Conservation Inspector and as a Research Assistant at Haryana Agricultural University and Ohio State University. He was the first agricultural engineer to receive the professional license in Agricultural Engineering in 1986 from the College of Engineers and Surveyors of Puerto Rico. On September 16, 2005, he was proclaimed as "Father of Irrigation Engineering in Puerto Rico for the twentieth century" by the ASABE, Puerto Rico Section, for his pioneering work on micro irrigation, evapotranspiration, agroclimatology, and soil and water engineering. During his professional career of 45 years, he has received many prestigious awards, including being recognized as one of the experts "who rendered meritorious service for the development of [the] irrigation sector in India" by the Water Technology Centre of Tamil Nadu Agricultural University in Coimbatore, India. A prolific author and editor, he has written more than 200 journal articles and textbooks and has edited over 50 books. He received his BSc degree in engineering from Punjab Agricultural University, Ludhiana, India; his MSc and PhD degrees from Ohio State University, Columbus; and his Master of Divinity degree from Puerto Rico Evangelical Seminary, Hato Rey, Puerto Rico, USA. Durgesh Nandini Chauhan, MPharm, has several years of academic (teaching) experience at institutes in India in pharmaceutical sciences. She taught subjects as pharmaceutics, pharmacognosy, traditional concepts of medicinal plants, drug delivery, phytochemistry, cosmetic technology, pharmaceutical engineering, pharmaceutical packaging, quality assurance, dosage form designing, and anatomy and physiology. She is member of the Association of Pharmaceutical Teachers of India, SILAE: Società Italo-Latinoamericana di Etnomedicina (The Scientific Network on Ethnomedicine, Italy), and others. Her previous research work included "Penetration Enhancement Studies on Organogel of Oxytetracycline HCL." She has attended several workshops, conferences, and symposiums, including the AICTE-Sponsored Staff Development Program on "Effects of Teaching and Learning Skills in Pharmacy: Tool for Improvement of Young Pharmacy Teachers." She has written more than ten articles published in national and international journals, eleven book chapters, and authored in one book (Optimization and Evaluation of an Organogel, in press). She is also active as a reviewer for several international scientific journals and an active participant at national and international conferences, including Bhartiya Vigyan Sammelan and the International Convention of Society of Pharmacognosy. Presently she joined Ishita Research Organization, Raipur, India as a freelance writer and guide for students in pharmacy, Ayurvedic, and science in their research projects.